In the bowl of a stand mixer fitted with the dough hook, dissolve the yeast and one tablespoon of the sugar in the warm water until foamy, about 5 minutes. Add the milk, egg, vanilla, butter, remaining sugar, baking soda, salt, and flour. Beat on medium high speed for 1 minute until a sticky dough has formed. Transfer the dough to a well floured work surface, dust with more flour, and roll to an 1/8 inch thickness. Using a pastry wheel, cut the dough into 2 inch squares with some irregular shapes around the edges. Preheat the oil to 370° F. Gently drop the squares, a few at a time, into the hot oil. Once they have risen and puffed, flip and cook on the other side until golden brown. Drain on paper towels and repeat with the remaining dough. Generously dust with confectioners' sugar. Serve warm. Enjoy! I am beyond impressed! I love beignets-yum! Looks just like I remember them! I'm sure Mom and Dad were thrilled we were blowing sugar across the table at each other :) I've used the Cafe Du Monde quick mix, but can't wait to try these homemade!! This an easy dough to work with and I would recommend it to an entry level baker (not that I am professional). The most important factor is having the oil at the proper temperature. Too low and they won't soufflé, too high and they will brown too quickly. I've just made these beignets recently and wanted let you know these beignets are pretty close to the real thing (speaking as an exiled yat). Thanks for sharing. 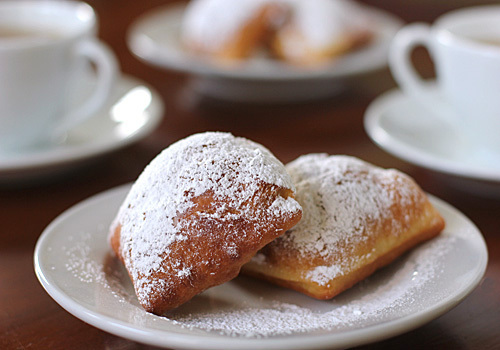 I just recently visited New Orleans and I'm looking for something as close to Cafe Du Monde as possible, and I hink these might finally be THE ONE!!! Thanks for the recipie! Made these delightful treats on Sunday. While I messed up my first attempt by killing the yeast (H2O too hot), I succeeded at making them on my second atrempt. So delicious!!! Great recipe! Thank you for sharing. You are welcome. I'm glad your second attempt was a success! I'm a transplanted NOLA native and was looking for a good receipt to get my beignet fix. This is a pretty good recipe. Dough was a little sticky, but the results were fairly authentic. I'd recommend it to those who want to get a taste of NO. A Cafe Du Monde beignet must have an almost-crispy crust and the inside must be airy yet chewy, and I've been looking for a recipe for that. I've tried so many on the internet, and I still have not found it yet. My beignets turned out like yours as well, they are puffy and pillowy. The outside looks like CDM beignet, but they don't taste the same. The flour/bread in my beignets sticked together on one side instead of evenly distributed, just like the one you pictured. And they tasted bready/cakey, not chewy and airy like a Cafe Du Monde beignet. 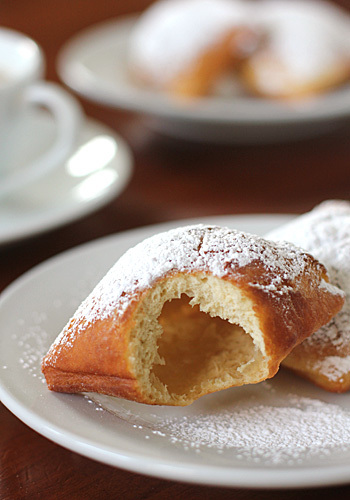 I would love to hear if you have been able to replicate a CDM beignet, and what the secret is. I've tried no rising time, little rising time, long rising time, warm, refrigerated dough, etc. etc. Still searching. I grew up eating CDM beignets and this is the recipe I use to achieve that crispy, airy, yet chewy texture. Super late response to this but since I was reading it I thought I would chime in: I put my beignet dough in an unheated oven for about an hour and let it rise in there, and then stored it in the fridge until it was ready to be used. This allowed it to get the airy rise that produces the crispy outside and hollow inside without over-proofing. I also used cold flour in my mixture, which I think might have slowed the rise a little as well. Amazing!!! I even forgot the butter and still came out pillowy! Question- do you think I could use baking powder instead of baking soda. Thanks! I have tried so many recipes and this is by far the best! I am so pleased you enjoyed them! I would not substitute the baking soda with baking powder. Great recipe, perfect every time, thank you! I have never refrigerated the dough overnight, so I can't say for sure. If you do try it, please let me know of your results.